One thing I’ve learned after living in the San Francisco Bay Area nearly 13 years, people here love an excuse to dress up—particularly in vintage clothes, hats, and costume jewelry—and create another world. 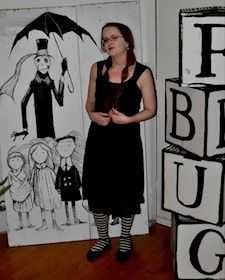 The Edwardian Ball originally started in 1999 as a small nightclub event to honor macabre storybook illustrator Edward Gorey. He’s perhaps most famous for his “Gashlycrumb Tinies,” an ABC book reciting the ghastly ways 26 children died. While Gorey was actually publishing his work in the 1950s and ’60s—and he was an American, not British, as some people assume—his characters tend to be proper buttoned-up sorts, dressed in gloomy Victorian and Edwardian styles, as well as sleek, black 1920s fashions. Influenced by Edgar Allan Poe and cartoonist Charles Addams (creator of “The Addams Family”), Gorey was also a big inspiration for movie director Tim Burton. Put on by a band called Rosin Coven and a circus troupe called the Vau de Vire Society, the two-night event held in the Regency Ballroom (built in 1909), has taken on a life of its own as a second, more elegant Halloween—a night to don a gorgeous corseted Edwardian gown or dapper suit, a hat, gloves, and perhaps Edwardian jewelry, a cane, a pocket watch, or a monocle. Then, naturally, you do a Viennese waltz, and maybe sip an absinthe cocktail. But it’s by no means strict. 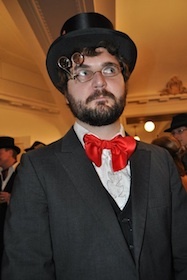 Some people go for a Victorian or steampunk look. Women often pull out their best ’20s drop-waist dresses, pearl necklaces, and cloche hats. Men favor candy-striped jackets and straw hats. Others find whimsical inspiration in Poe, Addams, and Burton with a little Day of the Dead, Dr. Seuss, and “Alice in Wonderland” thrown in for good measure. The anachronisms can make your head spin, if you let them. The stage entertainment is alway top-notch, featuring circus acts, burlesque, live music, and DJ performers, culminating in goth chanteuse Jill Tracy, the “Belle of the Ball,” introducing a new waltz, and then, on the final night, Rosin Coven and Vau de Vire Society performing a high-flying theatrical interpretation of one of Gorey’s tales—this year it was “The Eleventh Episode”. The first night, the World’s Faire, also boasted a Victorian gaming parlor, including handmade ring toss, skee ball, and a shooting gallery. I’m usually a daredevil, but I couldn’t get myself to try the handmade pedal-powered Ferris wheel. Victorian steam-power gadgetry lovers Kinetic Steam Works also had an elaborate 10-foot-tall device set up to power a few fans and light bulbs. Most important to collectors, though, is that it’s a great event for antique-oogling. 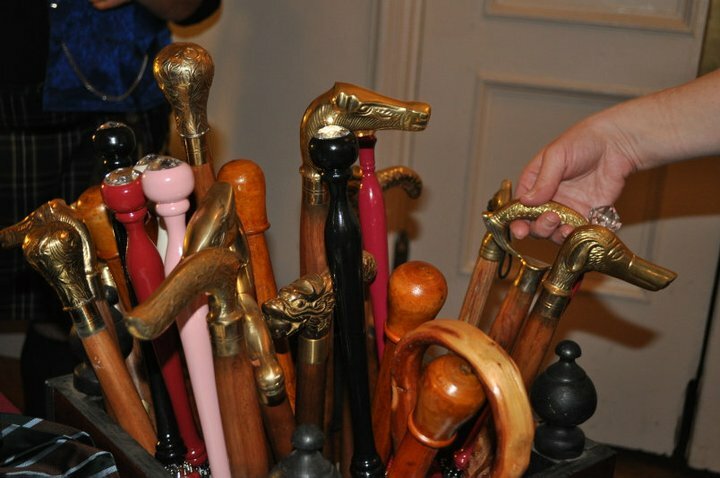 Of course, many of the gowns are brilliant modern-day replicas of Edwardian and Victorian items. But many women will stun you when they say their hat, gloves, or Art Deco dresses are period-authentic. Some men come with their grandfather’s watches or top hats. The Cabinets of Curiosity & Natural Wonders contained many wonderful (and creepy!) things. Beyond the taxidermy and formaldehyde jars, you could spy lovely lamps, scales, vintage photos and sketches, an antique wheelchair, a pedal car, a birdcage, and even a web of antique lace. 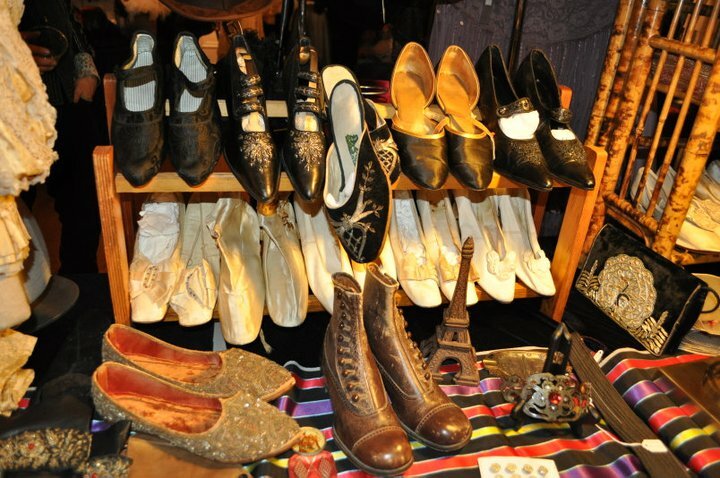 Then, the vendor’s market downstairs was a treasure trove for vintage lovers, offering authentic vintage dresses, slips, hats, shoes, and walking sticks, as well as handmade gifts. One vendor even had an antique hairbrush, handbags, buttons, hand fans, brooches, and ribbons. It was a true visual feast. 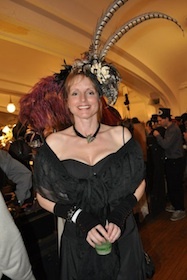 The next Edwardian Ball happens Saturday, March 5, at the Music Box in Los Angeles. See more photos on my Show & Tell page. Should You Feel Guilty About Wearing Vintage Fur? “ ” No man, no matter how knowledgeable, can be as familiar with the feminine form as a woman.